Metallika, a gelding with $8,001 in prior cutting earnings before heading to the Breeder’s Invitational (BI) in Tulsa, Okla., returned to Texas with more than $92,000 earned and as the BI Derby Open Champion for his owner Scotty Rice, after marking a 225 in Saturday’s finals with his trainer and Scotty’s brother, Tag. The BI’s 2009 Derby Open Champion Metallic Cat sired Metallika. 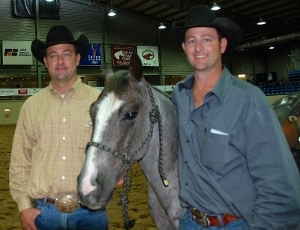 Nyoka Pep, a Dual Pep mare owned by breeder Billy Martin, of Millsap, Texas, produced him. While securing the Derby Open title and about $68,000, including a 10 percent fee actually split between his sire and his dam’s owners, Metallika also earned $10,000 as the BI’s Derby Open Sales Incentive Champion. Two days before topping the Derby Open finals, the horse and Tag Rice earned another $6,764 by tying for fifth place during the May 22 BI Derby Open $10,000 Novice finals. Scotty is 37, lives in Weatherford, Texas, and owns a Fort Worth, Texas, Internet access provider. He had planned to ride Metallika in the Non-Pro at the BI, too. Scotty switched horses, though, after Tag, who is 39, and Metallika posted 219 and 220 scores in the first two Open rounds. Scotty and Super Smart Rey earned about $9,000 by tying for ninth in Saturday’s Derby Non-Pro finals. Tag said his brother made a great team decision by deciding not to ride Metallika in the Non-Pro division. “Any time you can avoid running the wheels off of them, it’s better,” said Tag, who has trained several horses for his younger brother. The brothers’ father, Ronnie, has trained several horses for Scotty, too.